Strategies for cartel detection and prosecution differ across countries. This column uses a US dataset to show that independent directors of cartel-indicted firms favour the implementation of corrective actions in order to mitigate damage to their personal reputations. Firms with a larger fraction of independent directors on their boards observe smaller value losses and lower cartel duration during cartel-busting episodes. Antitrust actions against price fixing have increased dramatically over the last decades, both in the US and in Europe. The surge in cartel prosecution activity has been accompanied not only by tougher penalties, but also by enhanced cooperation with antitrust authorities, notably through leniency programs. Two prominent examples of such regulatory changes in the US are the Antitrust Criminal Penalty Enhancement and Reform Act adopted in 2004, and the ‘Amnesty Plus’ modification of the leniency policy adopted in 1999. Other jurisdictions have also introduced similar reforms. In Europe, antitrust fines were substantially revised in 2006 and several leniency laws and programs have been introduced over the last decades in different EU countries. The design of antitrust policies has been the subject to a great deal of debate. Reflecting the differing views of economic authorities around the world, policies exhibit significant cross-country variation. For example, a key difference between EU and US antitrust laws is that the US legislation contemplates criminal sanctions not only for corporations, but also for individuals. It has been argued that while leniency programs result in more prosecutions, a more lenient treatment of offenders could lead to the creation of cartels that are more stable and harder to uncover (Motta and Polo 2003, Spagnolo 2004). In a recent paper, we add to this debate by studying the role of corporate directors in cartel prosecutions (Campello et al. 2017). In particular, we argue that non-executive officials take action in cartel prosecutions in order to mitigate damage to their personal reputations. That is, in addition to civil and criminal penalties imposed by courts, market-based penalties can also shape prosecution outcomes. To see why, consider that outside directors are rarely subject to court monitored economic sanctions or imprisonment and generally have less convex economic interests in the firm's profits than managers and other corporate officials (who often receive stock- or option-based compensation packages). As such, independent directors’ ‘upside’ from cartel involvement is less likely to compensate for the costs of being associated with corporate misbehaviour. The indictment of Crompton for cartel involvement illustrates how independent directors can shape cartel prosecutions. As explained by Scott D. Hammond (Deputy Assistant Attorney General for Criminal Enforcement at the US Department of Justice Antitrust Division) in March 2006, “Crompton is a prime example of a company whose independent board of directors decided to leave no stone unturned in its commitment to investigate, identify and report antitrust violations... [T]he board's strategy resulted in the company receiving an extraordinary reduction in its rubber chemicals fine. Crompton’s early cooperation allowed the Division to conserve and focus its resources and to immediately put additional pressure on other subject companies and individuals to cooperate” (Hammond 2006). Our study focuses on two intriguing questions. The first is whether market-based penalties are strong enough to induce directors to cooperate with antitrust authorities. But perhaps equally intriguing is whether corporate directors’ actions are in the best interest of shareholders. While cooperation with antitrust authorities can mitigate some prosecution costs, the end of price fixing also results in shareholders losing substantial rents. We study various dimensions of cartel prosecutions using a comprehensive set of US public firms indicted by antitrust authorities across various international jurisdictions between 2002 and 2012. As a starting point, we analyse the stock market reaction to first-time news concerning cartel prosecutions. In particular, we model abnormal equity returns to cartel indictments as a function of the proportion of independent directors serving on the boards of the firms in the sample. Next, we provide direct evidence regarding the reputational costs borne by independent directors of cartel-indicted firms. Our analysis shows that, following prosecution announcements, directors of firms involved in cartels lose a significant number of directorships in other firms. Notably, even when directors do not lose positions in other firms, they still lose voting support across their portfolio of outside directorships. These results reveal that professional directors of cartel firms suffer significant labour market reputational costs following regulatory indictments. We also provide evidence of the proactive role played by independent directors in cooperating with antitrust authorities, as well as in punishing managers involved in price fixing schemes. We do so by examining two dynamics that take place in cartel prosecutions. First, we examine the relationship between the probability of applying for leniency and the presence of independent directors on boards. We show that firms with a higher proportion of independent directors on their boards are much more likely to apply for leniency programs during the course of cartel prosecutions. Second, we show that firms with a higher proportion of independent directors are also more likely to replace their scandal-laden CEOs following cartel prosecution announcements. These results indicate that independent directors favour the implementation of corrective actions that aim to mitigate reputational damage arising from price fixing scandals. We further gauge the economic significance and regulatory implications of our results by exploring whether the presence of independent directors on the boards of cartel firms translates into lower cartel duration. Figure 2 presents survival rates for those cartels that were formed prior to the start of the sample period. The horizontal axis indicates the number of years after 2001. ‘Below Median Independent Directors’ refers to cartels formed by firms with a percentage of independent directors which is below the median. ‘Above Median Independent Directors’ refers to cartels formed by firms with a percentage of independent directors which is above the median. 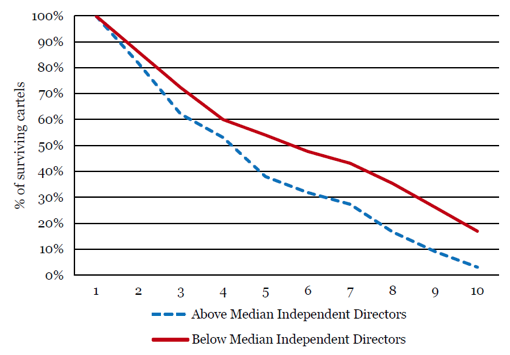 The survival function of the latter group exhibits a steeper downward trend, suggesting that cartels formed by firms with a higher percentage of independent directors on their boards experience a significantly lower probability of survival. All in all, our results are consistent with the argument that reputational incentives of independent directors play a role in cartel prosecution efforts. Our analysis contributes to the debate on antitrust policies by providing evidence on measurable and significant market sanctions against individuals involved in price fixing schemes. Critically, the incentives and actions of independent directors reduce the prosecution costs borne by shareholders and the stability of cartel schemes. The evidence we present is relevant for regulators designing and enforcing antitrust policies and for market participants seeking to understand the impact of corporate governance and antitrust regulation on firm value and corporate behaviour (Buccirossi and Spagnolo 2008, Harrington 2006). Buccirossi, P and G Spagnolo (2008), “Corporate governance and collusive behaviour”, CEPR Discussion Paper 6349. Campello, M, D Ferrés and G Ormazabal (2017), “Whistleblowers on the board? The role of independent directors in cartel prosecutions”, CEPR Discussion Paper 12143. Hammond, S (2006), “Measuring the value of second-in cooperation in corporate plea negotiations”, presented at the 54th Spring Meeting of the American Bar Association Section of Antitrust Law, Washington, DC. Harrington, J (2006), “How do cartels operate?”, Foundations and Trends in Microeconomics 2(1): 1-105. Motta, M and M Polo (2003), “Leniency programs and cartel prosecution”, International Journal of Industrial Organization 21: 347-379. Spagnolo, G (2004), “Divide et impera: Optimal leniency programs”, CEPR Discussion Paper 4840. The magnitude of the variation in equity returns is substantial. 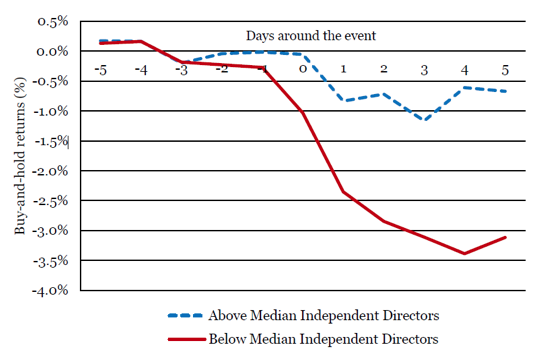 A baseline estimation suggests that a one-standard deviation increase in director independence – a mere one- or two-person increase in the number of independent directors in the average firm – is associated with an increase of nearly 50 basis points in the average one-day return around announcements involving cartel investigations.